It's super squishy because of it's double thickness. And oh so warm. Work in stockinette stitch throughout, working each stripe sequence in the same order. Begin with CC1, changing to CC2 and CC3 accordingly. Cut yarn between color changes. Work a 6 row stripe using each color. Work an 8 row stripe using each color. Work a 14 row stripe using each color. Work an 18 row stripe using each color. 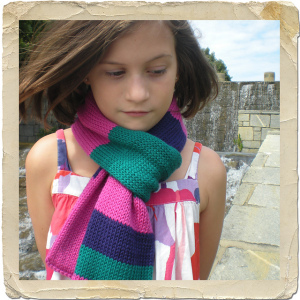 Work a 24 row stripe using each color. Work a 30 row stripe using each color. Work until piece measure ½ the length of side 1 - minus 2”. Change to CC3 and work a 14 row stripe. Change back to CC2 and work a 14 row stripe. Change to CC3 and work until piece measures the same length as side 1. Secure yarn (tie a small knot) at each color change before seaming. Tuck yarn ends toward the inside of scarf. With wrong sides facing together, seam entire scarf using the mattress stitch. Wet block using your favorite rinse less wool wash, such as Eucalan. Click here to download the free pattern PDF.